I know you were expecting Halloween pics – and they are coming. But today is Clean Out Your Fridge Day (really!) and I just couldn’t pass up posting about it. According to the folks at Practically Edible, this weird idea for a holiday was started in 1995 by the Whirlpool company. Here is the evidence of my participation. Although I have only been home about 1 week during the past month, and my fridge has not been fully stocked since I returned, I was still able to find and clear out some icky stuff. A tub of grated Parmesan cheese that expired in 2008 (hidden behind the one that is still considered fresh). A moldy lemon in a baggie. A pint of LONG overdue buttermilk, which I had intended to use for moss cultivation and never got around to it. A nearly empty container of poppy seed dressing I had made a couple of months ago which was showing signs of life. So a bit of nastiness, but all in all not too bad. I’ve seen (and had) worse. At least all my veggies were still fresh. So go clean out your fridge – or at least open the door and inspect it. Then come tell us about the most disgusting thing you find. there’s nothing creepy in my fridge, and it’s not cause I’m Donna Reed. Actually, I can’t stand shopping, especially at the big bargain stores. Craig doesn’t mind it but hates carrying big bags of groceries down our 34 stairs. So Craig shops every day, How European of him. He only gets what we can eat that day, so our fridge is basically the beer and fresh herbs storage unit. The freezer is a whole other story. OMG I would LOVE to clean out Tatiana’s fridge… but hey, it’s theirs so I maintain a corner of it. I cleaned my fridge out all the way a few weeks ago, when we moved. I found nothing of consequence. Oh wait, never mind. I just remembered a very moldy piece of squash I didn’t get around to cooking. That was pretty gross. Mmmm. Delicious. Luckily we try to clean it out every time we go grocery shopping… or at least every other time. But in the past we have found a very old cucumber in the bottom drawer. It was lovely. Nothing warms my soul like a good fridge cleaning out! 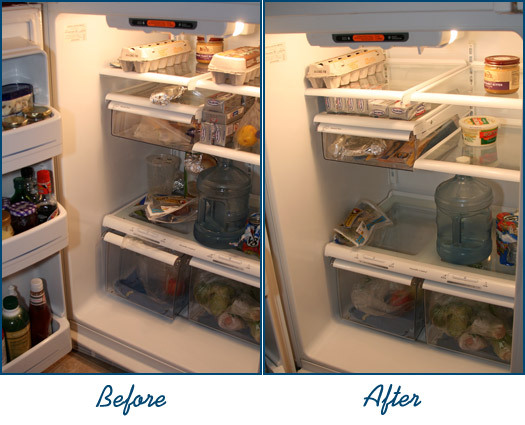 It didn’t really look like your fridge was that bad in the before pic, I have seen much much worse.